The world lost superstar musicians, stars of stage and screen, some of the greatest athletes of all time and larger-than-life political figures in 2016. 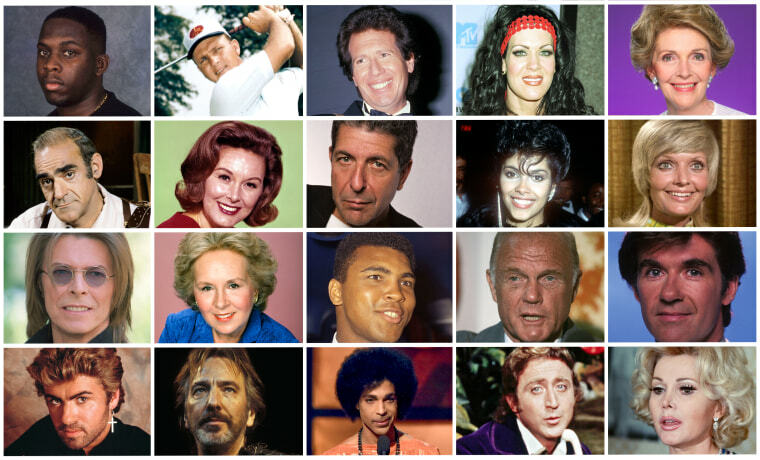 Here's a look at some of the many famous figures who died this year. Click through to read full obituaries. Pat Harrington Jr., 86, the actor and comedian who in the 1950s got attention as a member of Steve Allen's fabled TV comic troupe and decades later as Dwayne Schneider, the cocky handyman on the long-running sitcom "One Day at a Time," died on Jan. 6. David Bowie, 69, the other-worldly musician who broke pop and rock boundaries with his creative musicianship that spanned six decades, striking visuals and a genre-spanning persona he christened Ziggy Stardust, died on Jan. 10. Rene Angelil, 73, Celine Dion's husband and manager, who molded her from a French-speaking Canadian ingénue into one of the world's most successful singers, died on Jan. 14. Alan Rickman, 69, the classically-trained British stage star and sensual screen villain in the "Harry Potter" saga, "Die Hard" and other films, died on Jan. 14. Dan Haggerty, 74, the rugged, bearded actor who starred in the film and TV series "The Life and Times of Grizzly Adams," died on Jan. 15. Glenn Frey, 67, the rock 'n' roll rebel who co-founded the Eagles and helped write such hits as "Hotel California" and "Life in the Fast Lane," died on Jan. 18. Abe Vigoda, 94, the character actor whose leathery, sad-eyed face made him ideal for playing the over-the-hill detective Phil Fish in the 1970s TV series "Barney Miller" and the doomed Mafia soldier in "The Godfather," died on Jan. 26. Paul Kantner, 74, the founding member of Jefferson Airplane who stayed with the seminal band through its transformation from 1960s hippies to 1970s hit makers as the eventual leader of successor group Jefferson Starship, died on Jan. 28. Joe Alaskey, 63, a prolific voice actor best known for portraying Bugs Bunny, Daffy Duck and other beloved "Looney Tunes" characters, died on Feb. 3. Maurice White, 74, the Earth, Wind & Fire founder whose horn-driven band sold more than 90 million albums, died on Feb. 3. Dave Mirra, 41, a legend of BMX racing who held the record for the most career medals in the X Games for many years and hosted MTV's "Real World/Road Rules Challenge" for two seasons, died on Feb 4. Edgar Mitchell, 85, the Apollo 14 astronaut who became the sixth man on the moon when he and Alan Shepard helped NASA recover from Apollo 13's "successful failure," died on Feb. 4. Denise Katrina Matthews, 57, better known as Prince protege Vanity who sang in girl band Vanity 6 and appeared in the films "The Last Dragon" and "Action Jackson," died on Feb. 15. Antonin Scalia, 79, an influential conservative and most provocative member of the U.S. Supreme Court, died on Feb. 13. George Gaynes, 89, who portrayed an irritable foster parent on the '80s sitcom "Punky Brewster," the bewildered commandant in seven "Police Academy" films and a soap opera star with a crush on Dustin Hoffman's character in drag, in the hit feature comedy "Tootsie," died on Feb. 15. Boutros Boutros-Ghali, 93, the veteran Egyptian diplomat who helped negotiate his country's landmark peace deal with Israel but clashed with the U.S. when he served a single term as U.N. secretary-general, died on Feb. 16. Angela "Big Ang" Raiola, 55, the raspy-voiced bar owner who gained fame on the reality TV series "Mob Wives," died on Feb. 18. Harper Lee, 89, the elusive novelist whose child's-eye view of racial injustice in a small Southern town, "To Kill a Mockingbird," became standard reading for millions of young people and an Oscar-winning film, died on Feb. 19. Umberto Eco, 84, the Italian author who intrigued, puzzled and delighted readers worldwide with his best-selling historical novel "The Name of the Rose," died on Feb. 19. Sonny James, 87, the country singer who recorded romantic ballads like "Young Love" and turned pop songs into country hits, died on Feb. 22. Tony Burton, 78, who played Apollo Creed's inspirational boxing trainer in the "Rocky" franchise after his own glory days as a young prizefighter, died on Feb. 25. George Kennedy, 91, the hulking, tough-guy actor who won an Oscar for his portrayal of a savage chain-gang convict in the 1960s classic "Cool Hand Luke," died on Feb. 28. Lee Reherman, 49, the former Ivy League football star who shot to fame as the towering, muscular Hawk on the popular 1990s television show "American Gladiators," died on March 1. Joey Feek, 40, who with her husband, Rory, formed the award-winning country duo Joey + Rory, died on March 4. Pat Conroy, 70, the author of "The Great Santini," ''The Prince of Tides" and other best-sellers, whose novels drew upon his bruising childhood and the vistas of South Carolina, died on March 4. Nancy Reagan, 94, an actress who became one of the most high-profile and influential first ladies of the 20th century as the wife of President Ronald Reagan, died on March 6. George Martin, 90, the Beatles' urbane producer who quietly guided the band's swift, historic transformation from rowdy club act to musical and cultural revolutionaries, died on March 8. Keith Emerson, 71, founder and keyboardist of the progressive-rock band Emerson, Lake and Palmer, died on March 11. Frank Sinatra Jr., 72, who carried on his father's legacy with his own music career and whose kidnapping as a young man added a bizarre chapter to his father's legendary life, died on March 16. Bob Ebeling, 89, the booster rocket engineer who spent decades filled with guilt over not stopping the explosion of the space shuttle Challenger, died on March 21. Phife Dawg, 45, the lyricist whose witty wordplay was a linchpin of the groundbreaking hip-hop group A Tribe Called Quest, died on March 22. Rob Ford, 46, the pugnacious, populist former mayor of Toronto whose career crashed in a drug-driven, obscenity-laced debacle, died on March 22. Joe Garagiola, 90, the former former TODAY anchor and baseball player for the St. Louis Cardinals, Pittsburgh Pirates, Chicago Cubs and New York Giants, died on March 23. Garry Shandling, 66, the actor and comedian who masterminded a brand of phony docudrama with "The Larry Sanders Show," died on March 24. Jim Harrison, 78, the fiction writer, poet, outdoorsman and reveler who enjoyed mainstream success in middle age with his historical saga "Legends of the Fall," died on March 26. Mother Mary Angelica, 92, the folksy Roman Catholic nun who used a monastery garage to begin the Catholic TV powerhouse EWTN, died on March 27. Patty Duke, 69, who won an Oscar as a teen for playing Helen Keller in "The Miracle Worker," then maintained a long career while battling personal demons, died on March 29. Erik Bauersfeld, 93, who turned three words from a minor acting role — "It's a trap!" — into one of the most beloved lines of the "Star Wars" series, died on April 3. Merle Haggard, 79, the country giant who rose from poverty and prison to international fame through his songs about outlaws, underdogs and an abiding sense of national pride in such hits as "Okie From Muskogee" and "Sing Me Back Home," died on April 6. David Gest, 62, a music producer, reality TV star and former husband of Liza Minnelli, died on April 12. Doris Roberts, 90, who played the tart-tongued, endlessly meddling mother on "Everybody Loves Raymond," died on April 17. Les Waas, 94, the advertising legend behind the Mister Softee jingle heard in hundreds of ice cream trucks for more than half a century, died on April 19. Chyna, 46, the tall, muscle-bound, raven-haired pro-wrestler who rocketed to popularity in the 1990s and later made the rounds on reality TV, died on April 20. Prince, 57, one of the most inventive and influential musicians of modern times with hits including "Little Red Corvette," ''Let's Go Crazy" and "When Doves Cry," died on April 21. Michelle McNamara, a crime writer and founder of the website True Crime Diary married to comedian Patton Oswalt, died on April 21. Isabelle Dinoire, 49, the French woman who received the world's first partial face transplant, died on April 22. Papa Wemba, 66, known around the world as "the king of Congolese rumba," died on April 24. Billy Paul, 80, the jazz and soul singer best known for the hit ballad and "Philadelphia Soul" classic "Me and Mrs. Jones," died on April 24. Afeni Shakur Davis, 69, the former Black Panther who inspired the work of her son, rap icon Tupac Shakur, and fostered his legacy for decades after he was slain, died on May 2. Jane Little, 87, who at under five feet tall played the double bass for 71 consecutive years which earned her the Guinness World Record as the world's longest serving symphony player, died on May 15. Emilio Navaira, 53, the Grammy award winner, who with Selena was known as the king of Tejano music to her queen, died on May 16. Guy Clark, 74, the Texas singer-songwriter who helped mentor a generation of songwriters and wrote hits like "L.A. Freeway" and "Desperados Waiting for a Train," died on May 17. Morley Safer, 84, the veteran "60 Minutes" correspondent who exposed a military atrocity in Vietnam that played an early role in changing Americans' view of the war, died on May 19. Alan Young, 96, the actor-comedian who played the amiable straight man to a talking horse in the 1960s sitcom "Mister Ed," died on May 19. Nick Menza, 51, former drummer for the influential metal band Megadeth, died on May 21. Muhammad Ali, 74, the silver-tongued boxer and civil rights champion who famously proclaimed himself "The Greatest" and then spent a lifetime living up to the billing,died on June 3. Kimbo Slice, 42, the bearded street fighter who parlayed his Internet popularity into a mixed martial arts career, died on June 6. Theresa Saldana, 61, the "Raging Bull" actress who survived a stalker's brutal attack to become a crime victims' advocate and reclaimed her entertainment career with "The Commish" and other TV shows, died on June 6. Gordie Howe, 88, known as "Mr. Hockey," the rough-and-tumble Canadian farm boy whose blend of talent and toughness made him the NHL's quintessential star, died on June 10. Christina Grimmie, 22, the singer-songwriter and YouTuber who gained greater popularity on "The Voice," died on June 10. Ron Lester, 45, who played no. 69 — the oversized offensive guard Billy Bob — in the 1999 high school football flick "Varsity Blues," died on June 17. Anton Yelchin, 27, charismatic and rising actor best known for playing Chekov in the new "Star Trek" films, died on June 19. Ralph Stanley, 89, the godfather of traditional bluegrass music who found a new generation of fans late in life thanks to his Grammy-winning music for the 2000 movie "O Brother, Where Art Thou?" died on June 23. Bernie Worrell, 72, the "Wizard of Woo" whose amazing array of keyboard sounds helped define the Parliament-Funkadelic musical empire and influenced performers of many genres, died on June 24. Bill Cunningham, 87, the New York Times street-style photographer who for decades captured the fashions of everyday New Yorkers with the same zeal that he pursued celebrities and designers, died on June 25. Alvin Toffler, 87, a guru of the post-industrial age whose "Future Shock" and other books anticipated the disruptions and transformations brought about by the rise of digital technology, died on June 27. Buddy Ryan, a longtime coach who built perhaps the greatest defense in NFL history with the 1985 Bears, died on June 28. Scotty Moore, 84, a pioneering rock guitarist best known for backing Elvis Presley as a member of his original band and into superstardom, died on June 28. Pat Summitt, 64, the winningest coach in Division I college basketball history who uplifted the women's game from obscurity to national prominence during her 38-year career at Tennessee, died on June 28. Elie Wiesel, 87, the Romanian-born Holocaust survivor whose classic "Night" became a landmark testament to the Nazis' crimes and launched his career as one of the world's foremost witnesses and humanitarians, died on July 2. Michael Cimino, 77, the Oscar-winning director whose film "The Deer Hunter" became one of the great triumphs of Hollywood's 1970s heyday and whose disastrous "Heaven's Gate" helped bring that era to a close, died on July 2. Noel Neill, 95, the first actress to play Lois Lane — the intrepid journalist with a soft spot for Superman — in the 1948 movie serial "Superman," alongside Kirk Alyn, died on July 3. Abbas Kiarostami, 76, Iranian director whose 1997 film "Taste of Cherry" won the prestigious Palme d'Or and who kept working despite government resistance, died on July 4. Garry Marshall, 81, the legendary writer and director who created the wildly popular television programs "Happy Days," "The Odd Couple," "Laverne & Shirley" and "Mork & Mindy," died on July 19. Mark Takai, 49, the U.S. representative, war veteran and long-time legislator known for his bright nature and deep commitment to service, died on July 20. Rev. Tim LaHaye, 90, the co-author of the "Left Behind" series, a multimillion-selling literary juggernaut that brought end-times prophecy into mainstream bookstores, died on July 25. Youree Del Cleomill Harris, 53, an actress who became famous playing the Jamaican psychic Miss Cleo, claiming to know callers' futures in ubiquitous TV infomercials and commercials, died on July 26. David Huddleston, 85, a character actor best known for portraying titular roles in "The Big Lebowski" and "Santa Claus: The Movie," died on Aug. 2. Pete Fountain, 86, a clarinetist whose Dixieland jazz virtuosity and wit endeared him to his native New Orleans and earned him national television fame, died on Aug. 6. Barry Jenner, 75, the veteran character actor who rocketed into space as an admiral on "Star Trek: Deep Space Nine" and made dozens of other TV appearances during a 40-plus year career, died on Aug. 8. Kenny Baker, 81, who played the lovable droid R2-D2 in the "Star Wars" films, achieving cult status and fans' adulation without showing his face or speaking any lines, died on Aug. 13. Fyvush Finkel, 93, the Emmy Award-winning actor whose career in stage and screen started in Yiddish theater and led to memorable roles in "Fiddler on the Roof" on Broadway and on TV in "Boston Public" and "Picket Fences," died on Aug. 14. John McLaughlin, 89, the conservative commentator and host of a long-running television show that pioneered hollering-heads discussions of Washington politics, died on Aug. 16. Lou Pearlman, 62, the band boy mogul who launched the hit groups Backstreet Boys and 'NSync but was later sentenced to prison for a $300 million Ponzi and bank fraud scheme, died on Aug. 19. Matt Roberts, a guitarist and founding member of the rock band 3 Doors Down, died on Aug. 20. Toots Thielemans, 94, the Belgian harmonica player whose career included playing with jazz greats like Miles Davis and whose solos have figured on numerous film scores, died on Aug. 22. Steven Hill, 94, a versatile character actor in theater, films and television who achieved his greatest success late in life as grumpy District Attorney Adam Schiff on TV's long-running "Law & Order," died on Aug. 23. Sonia Rykiel, 86, the French designer dubbed the "queen of knitwear" whose relaxed sweaters in berry-colored stripes and eye-popping motifs helped liberate women from stuffy suits, died on Aug. 25. Juan Gabriel, 66, the Mexican songwriter and singer who was an icon in the Latin music world, died on Aug. 28. Gene Wilder, 83, the frizzy-haired actor who brought his deft comedic touch to such unforgettable roles as the neurotic accountant in "The Producers," the mad scientist of "Young Frankenstein,” and the title character in "Willy Wonka and the Chocolate Factory," died on Aug. 28. Jon Polito, 65, the raspy-voiced actor whose 200-plus credits ranged from "Homicide: Life on the Street" and "Modern Family" to the films "Barton Fink" and "The Big Lebowski," died on Sept. 1. Jerry Heller, 75, the recording impresario who helped N.W.A. bring West Coast rap acts to worldwide fame, died on Sept. 2. Phyllis Schlafly, 92, an outspoken conservative activist who helped defeat the Equal Rights Amendment in the 1970s and founded the Eagle Forum political group, died on Sept. 5. Lady Chablis, 59, the transgender performer who became an unlikely celebrity for her role in the 1994 best-seller "Midnight in the Garden of Good and Evil," died on Sept. 8. Greta Zimmer Friedman, 92, the woman in an iconic photo shown kissing an ecstatic sailor celebrating the end of World War II by smooching a nurse in Times Square, died on Sept. 8. Alexis Arquette, 47, the pioneering transgender actress and member of the prominent Hollywood family, died on Sept. 11. Edward Albee, 88, the three-time Pulitzer Prize-winning playwright who challenged theatrical convention in masterworks such as "Who's Afraid of Virginia Woolf?" and "A Delicate Balance," died on Sept. 16. W.P. Kinsella, 81, the Canadian novelist who blended magical realism and baseball in the book that became the smash hit film "Field of Dreams," died on Sept. 16. Curtis Hanson, 71, who won a screenwriting Oscar for "L.A. Confidential" and directed the psychological thriller "The Hand That Rocks the Cradle" and Eminem's tale of Detroit hip-hop "8 Mile," died on Sept. 20. Carlos Walker, 40, an Atlanta rapper known by the stage name Shawty Lo who was named MySpace Music Rookie of the Year at the 2008 BET Hip-Hop Awards, died on Sept. 21. Bill Nunn, 62, a veteran character actor who broke through in movies in the late 1980s, first in Spike Lee's "School Daze," then as the ill-fated Radio Raheem in the Oscar-nominated "Do the Right Thing," as well as appearing in the "Spider-Man" movie franchise, died on Sept. 24. José Fernández, 24, the Miami Marlins pitcher who won the National League's Rookie of the Year award in 2013, died on Sept. 25. Arnold Palmer, 87, the golfing great who brought a country-club sport to the masses with a hard-charging style, charisma and a commoner's touch, died on Sept. 25. Shimon Peres, 93, the former Israeli president and prime minister, whose life story mirrored that of the Jewish state and who was celebrated around the world as a Nobel prize-winning visionary who pushed his country toward peace, died on Sept. 28. Tommy Mykal Ford, 52, best known for his role as Tommy on the hit '90s sitcom "Martin," died on Oct. 12. King Bhumibol Adulyadej, 88, the world's longest reigning monarch who was revered in Thailand as an anchor of stability through decades of upheaval at home and abroad, died on Oct. 13. Steve Dillon, 54, a celebrated comic book artist best known for co-creating the "Preacher" and illustrating the popular Marvel title "The Punisher," died on Oct. 22. Janet Reno, 78, the first woman to serve as U.S. attorney general and the epicenter of several political storms during the Clinton administration, including the seizure of Elian Gonzalez, died on Nov. 7. Leonard Cohen, 82, the baritone-voiced Canadian singer-songwriter who blended spirituality and sexuality in songs like "Hallelujah," ''Suzanne" and "Bird on a Wire," died on Nov. 7. Robert Vaughn, 83, the debonair, Oscar-nominated actor whose many film roles were eclipsed by his hugely popular turn in television's "The Man From U.N.C.L.E.," died on Nov. 11. Leon Russell, 74, a singer-songwriter who emerged in the '70s as one of rock'n'roll's most dynamic performers after playing anonymously on dozens of pop hits as an in-demand studio pianist and was inducted into the Rock and Roll Hall of Fame in 2011, died on Nov. 13. Gwen Ifill, 61, the co-anchor of PBS' "NewsHour" with Judy Woodruff and a veteran journalist who moderated two vice presidential debates, died on Nov. 14. Holly Dunn, 59, a country singer who rose to fame with hits like "Daddy's Hands" and "You Really Had Me Going," died on Nov. 14. Sharon Jones, 60, the powerhouse singer who shepherded a soul revival despite not finding stardom until middle age, died on Nov. 18. Florence Henderson, 82, the Broadway star who became one of America's most beloved television moms in "The Brady Bunch," died on Nov. 24. Fidel Castro, 90, the cigar-chomping Cuban revolutionary leader and dictator who defied U.S. efforts to topple him for five decades, died on Nov. 25. Ron Glass, 71, the veteran television and film actor known for his Emmy-nominated role as NYPD Det. Ron Harris on the classic cop sitcom "Barney Miller," and later the deeply religious preacher Derrial Brook on the cult sci-fi show "Firefly," died on Nov. 25. Grant Tinker, 90, the television broadcasting legend and former NBC chairman who brought new polish to the TV world with beloved shows including "Hill Street Blues," died on Nov. 28. Greg Lake, 69, the prog-rock pioneer who co-founded King Crimson and Emerson, Lake and Palmer, died on Dec. 7. John Glenn, 95, the all-American hero who was the first U.S. astronaut to orbit the Earth before being propelled into a long career in the U.S. Senate, died on Dec. 8. Joseph Mascolo, 87, the actor who portrayed iconic "Days of Our Lives" villain Stefano DiMera, died on Dec. 7. E.R. Braithwaite, 104, a Guyanese author, educator and diplomat whose years teaching in the slums of London's East End inspired the international best-seller "To Sir, With Love" and the movie of the same name, died on Dec. 12. Alan Thicke, 69, the versatile performer who gained his greatest fame as the beloved dad on the sitcom "Growing Pains," died on Dec. 13. Craig Sager, 65, the longtime TNT sports broadcaster with a passion for colorful attire, died on Dec. 15. China Machado, 87, a groundbreaking model and fashion editor who broke barriers in 1959 when she became the first non-white model to appear on the cover of a major fashion magazine, died on Dec. 18. Zsa Zsa Gabor, 99, the Hungarian beauty queen-turned-nine-times-married Hollywood icon who once served three days in jail for slapping a cop, died on Dec. 18. George Michael, 53, the pop heartthrob whose career began with the hit duo Wham! in the 1980s and went on to have a hit solo career beginning with the chart-topping album "Faith," died on Dec. 25. Comedian Ricky Harris, who had a recurring role on Chris Rock's "Everybody Hates Chris" sitcom and voiced several characters that appeared in hip-hop albums, died December 26. British author Richard Adams, whose 1972 book "Watership Down" became a classic of children's literature died on Dec. 27. Barbara Tarbuck, best known for her long-running role as Lady Jane Jacks in "General Hospital" and more recently as Mother Superior Claudia on "American Horror Story: Asylum," died on Dec. 27. Carrie Fisher, 60, best known for her portrayal of the tough-talking Princess Leia who defies the Evil Empire in "Star Wars," died on Dec. 27. Debbie Reynolds, 84, the actress and singer who rose to fame opposite Gene Kelly in "Singin' in the Rain," died on Dec. 28, one day after the death of her daughter, Carrie Fisher. William Christopher, 84, the actor who played the unassuming U.S. Army chaplain, Father Mulcahy, on the long-running hit TV series "M*A*S*H," died on Dec. 31.